Behind each signature is an inscription - TEN POUNDS. Captain James Cook, The Royal Society of London for Improving Natural Knowledge, The Royal Navy (7 November 1728 - 14 February 1779) was a British explorer, navigator, cartographer, and captain in the Royal Navy. Cook made detailed maps of Newfoundland prior to making three voyages to the Pacific Ocean, during which he achieved the first recorded European contact with the eastern coastline of Australia and the Hawaiian Islands, and the first recorded circumnavigation of New Zealand. This new Ash series was issued mainly to replace George V by George VI on the front of the notes. This photographic 'collage' of King George VI was used as a reference image for the 1939 notes. 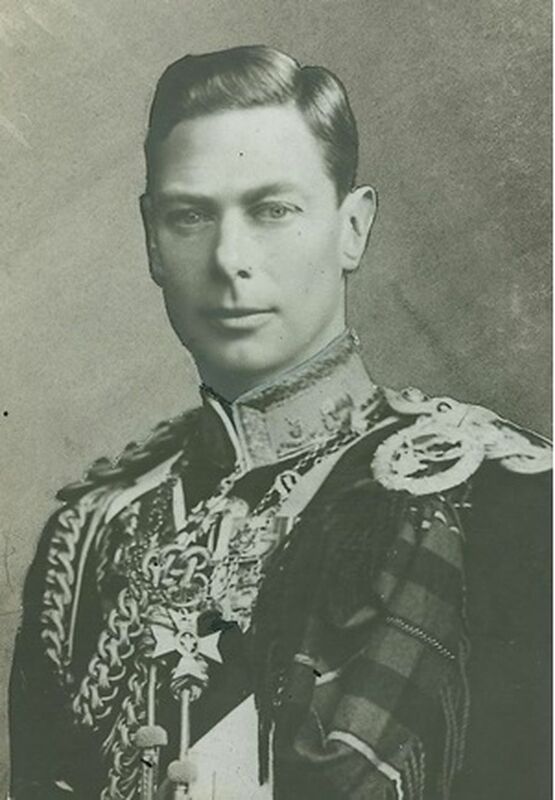 It was created by superimposing the (head) portrait of George VI on the torso taken from a photograph of Edward VIII, whose abdication in 1936 led to the need for a new note design featuring George VI. On left side is Australian coat of arms. The coat of arms of Australia (formally known as Commonwealth Coat of Arms) is the official symbol of Australia. The initial coat of arms was granted by King Edward VII on 7 May 1908, and the current version was granted by King George V on 19 September 1912, although the 1908 version continued to be used in some contexts. In the top half of the shield, from left to right, the states represented are: New South Wales, Victoria and Queensland. In the bottom half, from left to right: South Australia, Western Australia, and Tasmania. Above the shield is the seven-pointed Commonwealth Star or Star of Federation above a blue and gold wreath, forming the crest. Six of the points on the star represent the original six states, while the seventh point represents the combined territories and any future states of Australia. In its entirety the shield represents the federation of Australia. The Red Kangaroo and Emu that support the shield are the unofficial animal emblems of the nation. They owe this recognition to the fact that they are native Australian fauna (found only on that continent), and likely chosen because they are the most well-known native Australian animals large enough to be positioned together in scale holding up the shield. It is often claimed these animals were chosen because neither animal can move backward, only forward - i.e. progress. In reality both animals can move backwards, but infrequently do. 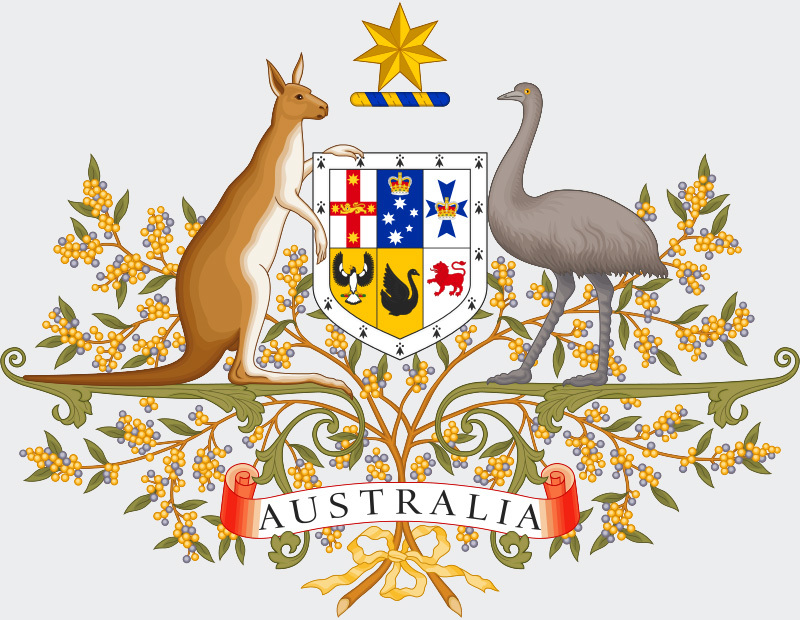 In the background is wreath of Golden Wattle, the official national floral emblem, though the representation of the species is not botanically accurate.At the bottom of the coat of arms is a scroll that contains the name of the nation. Neither the wreath of wattle nor the scroll are technically part of the official design described on the Royal Warrant that grants the armorial design. Denominations in numerals are in all corners. In words - centered, on top. This note shows Agriculture - on the banknote, an engraving showing farmers, with a sickle and a sheaf of wheat, leading a horse. A dog runs alongside. There is also a woman with a child, in her arms. Agriculture today is one of the main branches of the Australian economy. The share of agriculture in Australia’s GDP is 12%, the gross value added in agriculture and cattle breeding is more than AU $ 155 billion. 61% of the country’s area covers 135,996 farms and cattle farms, combining irrigated land with rainfed fields. The demographic situation, climatic conditions and a secured external market from the very beginning turned the fifth continent into a raw material colony of a developed capitalist country. Lack of labor, dry climate, vast territories, lack of predators created an extremely favorable background for pasture sheep breeding. The acute food shortage that arose in the country mainly during and after the gold rush, as well as the agrarian legislation of the 60-90s. XIX century. stimulated the specialization of agricultural production in various Australian colonies and the relatively rapid growth of crop production. Since the end of the XIX century. in connection with the development of transport, refrigeration and scientific and technological progress in general, the fifth continent is becoming a major exporter to the world market not only wool, but also meat and dairy products, and wheat, the low cost of production of which provides this country one of the first places among grain exporters . In the 90s. XIX century. at the height of the European agrarian crisis, Australian bread first appeared on the European market. In the course of scientific and technical re-equipment and intensification of agricultural production, pasture cattle breeding is shifted into the interior of the continent, and its place is taken by the production of wheat and other crops, intensive market gardening and horticulture, as well as intensive animal husbandry of meat, wool and dairy. 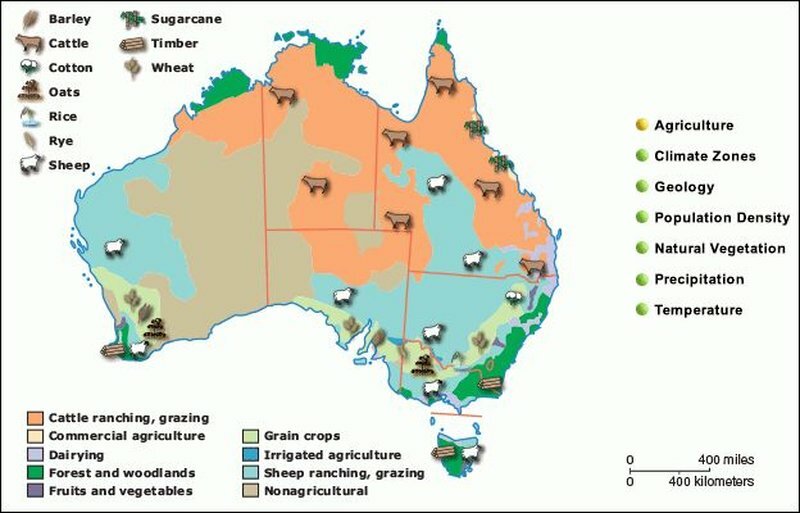 Australian livestock and crop production is organized on a purely capitalist basis. The dominant position in agriculture is currently occupied by large and partly medium-sized farms, joint-stock companies, in whose hands are concentrated fields, herds and pastures, large slaughterhouses, elevators and meat-canning plants, transporting products to the world market. Large capital is being introduced not only in the sphere of agricultural supply and marketing of its products, but also in agricultural production itself. The state implements a number of measures to regulate the production and marketing of agricultural products. The production and export of agricultural products in Australia over the past century has had a general upward trend, interrupted, however, by sharp drops during agrarian crises, world wars and natural disasters (devastating droughts). Since the end of the XIX century. There has been a trend towards the reorientation of Australia’s foreign trade in agricultural products from the UK market to the markets of other European countries, Japan, and later to the markets of the United States and countries of East and Southeast Asia. Since Australia has ample opportunities for the further development of capitalism in agriculture both "in breadth" and "in depth", there are real prospects for strengthening Australia's role in the global agricultural market. Denominations in numerals are in all corners and centered, at the bottom. In words - centered, at the top.